When R‑Studio starts, its main panel appears on the Windows desktop. Click the panel regions to learn their functions. R‑Studio shows hard drive S.M.A.R.T. states using their icons. Normal : This state indicates that the hard drive is in good conditions. Warning: This state indicates that some small problems with the disk are possible in the future, you may work with it but with cautions and regular check of these parameters. Disk imaging is strongly recommended. Critical: This state indicates that the hard drive conditions are critical and chances of hardware failure are great. The best recommendation for this case is to stop working with the disk and bring it to professional data recovery specialists. You may though continue to work with the disk at your own risk, but disk imaging is very strongly recommended. 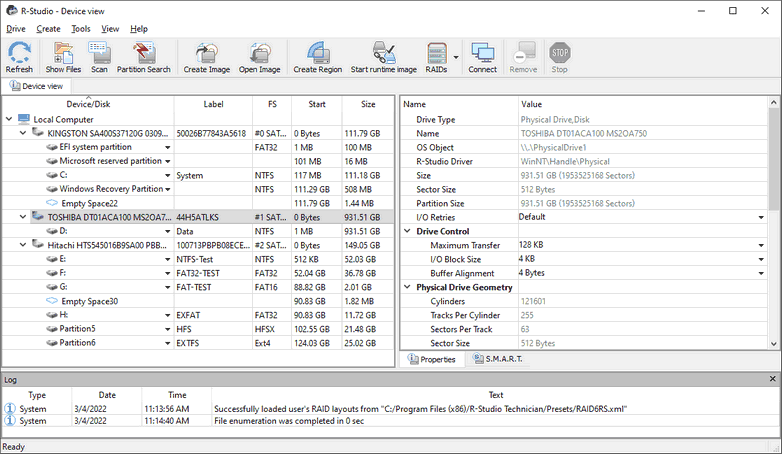 When a hard drive is selected on the R‑Studio main panel, an additional S.M.A.R.T. tab will appear. You may view the detailed S.M.A.R.T. data of the drive. S.M.A.R.T. (Self-Monitoring, Analysis and Reporting Technology) is a technology widely-used in hard drives and solid-state devices that monitors their reliability conditions to predict possible hardware failures. You may select the language of R‑Studio main panel and its help. To do so, select an available language on Change Language on the Help menu. You may set which panels and bars to enable/​disable. Sometimes, there may be a lot of similar objects on the Drives panel. Those may be components of a RAID, for example. You may turn numerical indexes for such objects to distinguish them better. Those indexes will appear before the object names on the Drives panel. 2 Select the units in which you want to see object sizes. Depending on the task R‑Studio performs, its panel may vary. Those panels are described in appropriate topics. The Properties tab names and values are described in detail on the Properties tab topic. The general settings can be set on the Settings dialog box. You may also copy the object's information displayed on the Drives panel. Right-click the object on the necessary column and select Copy Device/Disk , Copy Label , and so on. File search on a partition (including recently found during disk scan). In this mode, R‑Studio analyzes MFT s on NTFS partitions, FAT s on FAT partitions, and SuperBlocks on Ext2/3/4FS partitions. Then it displays all files which records have been found in the analyzed tables. Then recently deleted files, which records still remain, can be recovered. If files have not been found, that means that their records have been deleted. In this case, the disk must be scanned. File search supports file masks and regular expressions . Multiple files in different folders can be found and recovered in one recover session. R‑Studio supports mass file recovery . There is no limit in the number of files that may be recovered during one session. File content may be previewed before recovery. File or disk binary data can be viewed and edited in the Text/​hexadecimal editor . Also can be viewed and changed all attributes for NTFS files. Disk scan , searching for partitions. In this mode, R‑Studio scans the entire disk or its part. Using a number of statistic and deterministic criteria known as IntelligentScan technology, it determines existing or existed partitions on the disk, and their file systems. It is also possible to add new partitions, by setting manually all required parameters. A disk can be scanned through several successive scans, each with its own parameters. R‑Studio accumulates the information from successive scans and keeps track of changes in the information obtained from different scans. The information obtained from the disc scan can be stored in a file. It may be loaded and processed later at any convenient time.